Here are some great tips to get that old, pesky wallpaper off your walls. Resist the urge to paint over old wallpaper. You’ll get the best results by removing wallpaper first before repainting. Remove everything from the wall. Move furniture and place sheets over items and put a ground sheet on the floor to pick up all the waste. You’ll need a few basic items to get the job done well such as a 3-inch wide putty knife, glue softener, a simple scoring tool, mild washing detergent, and intrepid spirit/liquid stripper, a wallpaper scoring tool and some old clothing. Use the putty knife to peel up a corner and start pulling the wallpaper. While removing the wallpaper. You might also like to use a liquid striper concentrate. Be sure to mix the concentrate with water in line with the product’s directions. If required use a scoring tool to make pinholes across the old wallpaper for the glue softener. Glue softener will reduce the elbow grease required. It is also great if there are several layers of paper that need to be taken off. Once the wallpaper is completely off use a mix of mild detergent and water to wash the wall thoroughly. 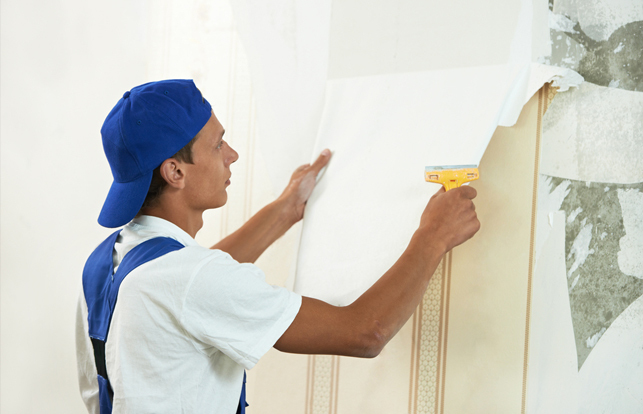 Lastly, repair any wall damage such as dents, holes, scrapes or gouges. And be sure to let your walls dry and use a primer before you re-paint. Of course, you can always ask The Colour Palette to get your walls ready. We’d only be too happy to help and we’ll be sure to do a great job. THE BEST SEASON TO PAINT IS?